Several years ago the American Society for Microbiology conducted an experiment to find out how many people who said they washed their hands after using a public restroom actually did so, and discovered that only two-thirds were following through. The rest were potentially spreading viruses and bacteria. But the risks of poor hand hygiene don’t stop in the restroom. Microbes carrying cold and influenza can lurk for days on door handles, light switches, desks and computer keyboards. Then one touch to the nose or mouth, and a person is ill. It’s a vicious cycle that can quickly escalate to an epidemic. Symptoms can be hard on a healthy adult, but for children, the elderly and people with compromised immune systems, they can be deadly. Designing systems and specifying products that will help protect building occupants and cleaning employees from disease can reduce absenteeism and presenteeism (sick people coming to work), increase productivity, protect funding in schools and help contain escalating group health insurance premiums. Aside from having hand sanitizer dispensers at doorways and on desks, the best opportunity to remove harmful microbes from hands is in the restroom, which is best achieved through a combination of a clean appearance, appealing products, the right equipment and appropriate signage. The cleaner the restroom (even the perception of clean) can mean the difference between building occupants washing their hands with soap for the 15 seconds recommended by the Centers for Disease Control, or bolting out the door. Since people are more apt to spend time washing and drying their hands when the restroom feels healthful and appealing, creating that image is vital. While janitors cannot force people to wash up, they can offer incentives that increase the likelihood. First, remind patrons of the importance of hand washing with signs, which are often available for free online and from distributors. Posters from manufacturers explain the risks, benefits and techniques of proper hand washing and can be a helpful component in preventing the spread of bacteria and viruses. Daniel Josephs, general manager of Spruce Industries Inc., who works with a variety of New York City and New Jersey schools from kindergarten up through advanced institutions, says that kids respond very well to posters hung at drinking fountains, in gymnasiums, locker rooms and cafeterias. “These visible reminders are probably the best thing cleaners can do to encourage hand washing,” he says. Adding no-touch soap and paper dispensers is quick and often free thanks to proprietary products offered at no cost by manufacturers. The fixtures have the added benefit of reducing the number of touch points for possible cross-contamination in the restroom. No matter what type of dispenser is used, many distributors encourage the use of soap cartridge systems. The suggestion is primarily because janitors don’t typically clean traditional receptacles between refills, which can breed bacteria. Sometimes more important than the dispenser is what is inside. According to Hall, building occupants prefer foam soap and usage increases when foam is available. He adds that foam also reduces labor costs by providing up to eight times the number of hand washes as traditional soap. No scent, or a very light scent is recommended for the most universal appeal, and so that it doesn’t aggravate allergy-prone noses. Sensitive skin should be kept in mind, too, especially in the winter, as soap that abrades already-dry skin may dampen enthusiasm for hand washing. 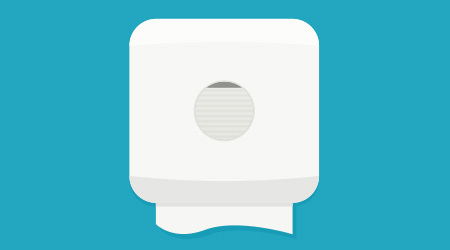 Positioning soap so that it is easy to reach, and near water, hand-drying equipment, and trash receptacles is another way to make the task of washing easier. It also helps keep the restroom tidier. Electric or battery-powered hand dryers can encourage hand washing because they don’t run out like towels can. New, more powerful models can also dry hands in as little as 15 seconds. Paper towels have positive attributes, too. They provide quick drying, and if automatic dispensers are used, there are no buttons or leverage to touch helping to reduce cross-contamination. Towel dispensers can also be designed to coordinate with other products to dictate an overall tone in the restroom. Whether it's due to the type of product, its placement within the restroom, or recent health scares, hand hygiene is on the rise. People who were reluctant to wash their hands before are washing now for their own personal safety. Officials from the Centers for Disease Control (CDC) hope hand washing becomes a habit among the general public. With the H1N1 pandemic in full force and the flu season progressing, now is not the time for building occupants to let their guard down when it comes to proper hand hygiene.